Menu Planning in 3 Easy Steps! As a working mom getting dinner on the table can be a challenge. Having a plan for your meals makes it so much easier to keep your family fed. I’m sharing my 3 easy menu planning steps. You’ll never have to wonder what’s for dinner ever again. Yes, I’m that OCD mom that has a weekly menu hanging on her refrigerator. Why? I like to make just one trip to the store a week and know that we’ve got enough food to last the whole week. I also don’t want to be stuck at the end of a busy day of dropping B off at school, working, picking him up, doing homework and activities wondering what’s for dinner. To be honest I’ve been making my weekly menu before we even had B when it was just me and my husband. It’s a great way to avoid multiple trips to the store and those annoying circular conversations of “what do you want for dinner”, “I don’t know what do you want”, “ I don’t care” and so on. I’m flexible with the menu so if I don’t feel like cooking we can eat leftovers or go out. And that’s one more meal I don’t have to think about next week. Getting into menu planning can seem daunting at first. These three steps make it quite easy. The more you meal plan, the better you’ll get and the easier it will be. Also, you can save your menus and reuse them for different weeks. This simple menu planning template will help you easily plan your meals. It’s a Word doc you can download, edit and print to suit your needs. Fill in dates and any events- This will help you know if you’ll be eating out or need something quick and easy. You don’t want to plan a meal that takes a lot of prep or cooking time if you’ve got sports or other activities. I usually include school activities, sports, birthday parties, vacations, work travel and anything else that would cause a change to our regular eating habits. Fill in meals- Now that you know what each day will look like you can assign meals to each day. I like to fill in breakfast, lunch, dinner and snacks for each day. We usually have leftovers and eat them for lunch the following day which makes things easy. For dinners I like to pick a meal from each main dish category (beef, chicken, seafood, vegetarian). Then we usually have a fend for yourself night where we eat leftovers or breakfast for dinner. I cook Sunday-Thursday and we eat out Friday & Saturday. Make a grocery list- Now you can just go down your menu to see what you need from the grocery store and get everything in one trip! Hate to grocery shop? Check out my Simple Grocery Shopping System. 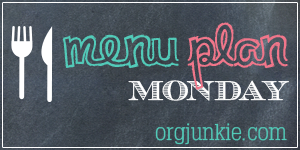 I’ll be sharing my menu each week on my Weekly Menu page. Be sure to subscribe to see what we’re having each week and get some new meal ideas of your own. When available I try to link to the recipes I’m using so you can try them as well. Putting together a menu plan for the week does require a little bit of prep work. But, the time you spend putting it together will pay off. With a plan you won’t have to spend time making multiple grocery store runs during the week. It also frees up precious space in your already overcrowded mind. You won’t have to try and think of meal ideas on a daily basis. Leslie, I LOVE your blogs! Your last one even got me thinking about working out again 😉 I LOVE you ideas and how organized you are. I struggle with meal planning, this system is awesome and simple once you get it all together. Thanks for taking the time to share your awesome ideas. Thanks Michelle! I appreciate your support! I’m glad you find it useful.